As Central Oregonians, our outdoor gear gets used a lot and we get attached to it. Whether it’s camping, skiing, hiking or river clothing and gear, there’s constant wear and tear — this is where Rugged Thread comes in. Specializing in sewing technical repairs of outdoor clothing and gear for over eight years, Rugged Thread offers unique repair services and believes that the story of our gear doesn’t end in a landfill. Owner and Operator, Kimberly Kinney has been in the outdoor industry for over 27 years. She began by repairing, tailoring and sewing custom ski wear in a small shop in Utah. Through marriage, raising a family and moving to Bend, Kinney followed her passion by getting advanced education and owning a business where she could use her skill set and be connected to the outdoor community. In Bend, “I started with outerwear repairs because that is what I knew how to fix, now we do all four seasons of outdoor gear repair based on what our community needs. The biggest repair need is zippers. Rugged Thread stocks at least 80 different parts. 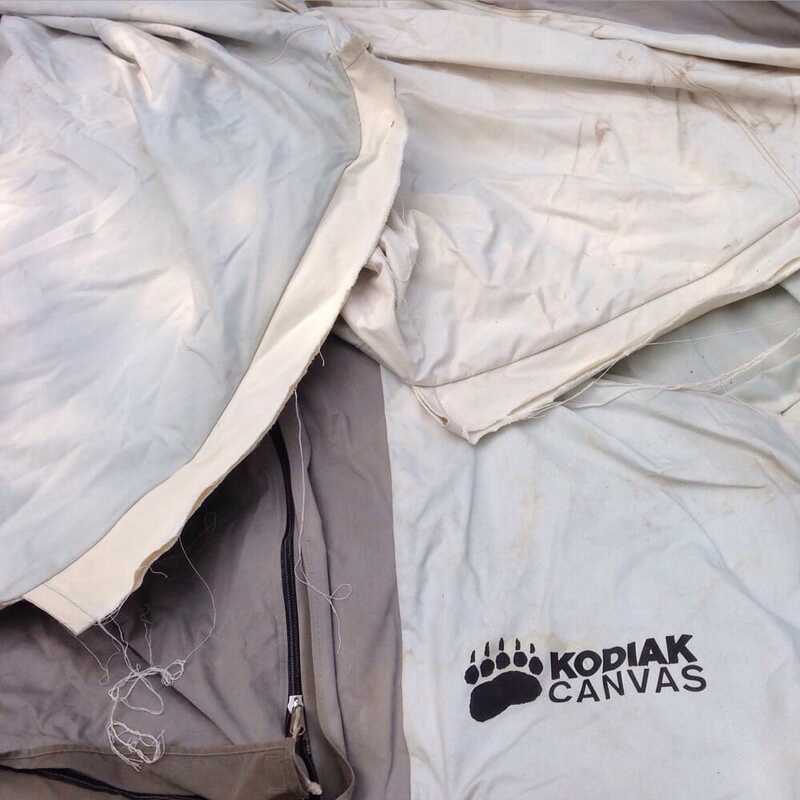 People bring us all kinds of broken zippers ranging from jackets, tents and bags that separate to occasional jeep and camper zippers that stop working,” says Kinney. During the summer, they do more than fix things, they build things like Sprinter Van screens and curtains and other fun items. One of the greatest milestones for Rugged Thread was getting REI of Bend as a customer. They started repairing warranty items then put together a mobile repair facility that was taken on site to REI’s quarterly garage sales. Rugged Thread takes a staff of three, two industrial machines, a full color spectrum of strong outdoor threads, tent screen repair fabrics, zipper repair tools and supplies, patching materials, buckles, webbing, etc. so that they can repair almost anything that they could fix in their shop. This mobile garage sale repair relationship that was built in Bend is so successful that it has become a national campaign at all REI stores across the nation. REI continually finds the value of repairing items to increase customer engagement, sales volume and brand loyalty. You can find Rugged Thread fixing items for free at REI’s quarterly garage sales. The next sale is on September 22, 2018. “Another milestone [was] presenting at Bend Outdoor Worx Venture Out Conference during the Bend Venture Conference week in October of 2017. That’s when I stopped working on repairs for quite a few weeks to integrate my outdoor industry experience into a vision that I could present at the Tower Theater that others foreign to the world of repairs would understand. I knew I needed help and experienced people to get involved to scale repairs to a national level,” says Kinney. Putting a vision of ‘creating an innovative repair economy’ on paper and talking to others has helped Kinney realize that her passion for repairs in the outdoor industry is about building relationships, making the world a better place and innovating change. The national outdoor industry repair need is conservatively estimated at $2.5B annually. “When we capture even one percent of that market it adds up to $24 million in repairs, an audacious goal with positive environmental, social and economic impacts in Central Oregon. We are planning to open a repair facility here in Central Oregon that will scale in phases and employ ten to forty skilled technicians,” says Kinney. Outdoor products are expensive therefore, skilled technicians that ideally love the outdoors and understand this kind of equipment can be challenging to find and retain. Kinney strongly believes in vocational training, including industrial sewing, because it builds social equity and living wage jobs. She learned to sew in 4H and the skill allowed her to work at a pay rate far above minimum wage. Although she dropped out of college to ski, she used this skill to build and sell a business that launched her into a new career of product development and merchandising, as well as gain an education, raise a family, buy a home, and it provides an ongoing course in business development. It is her experience that innovative living wage jobs can be a gateway to lifelong learning, personal fulfillment and provide opportunity to break cycles of dysfunction and poverty. There’s a plethora of educational opportunities offered in Central Oregon that kids and adults can take advantage of, “I see that we’re not just going to leverage the education system but we’d like to help develop vocational training curriculum to create a pipeline of skilled craftspeople”. Resource groups like Bend Outdoor Worx, BendTECH Center, SBA, Starve Ups and weekly advisory board meetings have helped Kinney understand how to plan and scale a business. Camber, a female business support organization recently hosted a pitch fest in Denver which Kinney attended and networked with like-minded people who are passionate about impactful social, environmental and economic shifts in the outdoors. “The outdoor industry is facing a waste crisis because nearly all products from ski jackets to sleeping bags to backpacks are manufactured from petrochemicals that do not breakdown in landfills and pollute microscopic plastics into 95 percent of our drinking water,” says Kinney. Repairing items are important to the environment, extending the life of a garment by an extra nine months reduces its environmental impact by 20-30 percent. Inexpensive labor overseas has shifted manufacturing away from a repair model to a replacement model. Over eight million tents, outerwear jackets, pants, backpacks and adventure clothing are tossed every year because of something as repairable as a broken zipper, a popped seam or a missing snap. “The manufacturer warranty no longer fixes items but overproduces in order to replace broken items. Generally, there are no skilled labor, machines or space maintained by manufacturers to fix things,” but repairs can actually reduce product replacement costs by up to 40 percent,” she adds.